I'm quite tardy with this post since the new Word Art Wednesday challenge started yesterday. I've been under the weather and haven't been able to be on the computer. I'm still in the "no energy" phase of recovery but definitely better. Anyway, this week the challenge focus verse is Isaiah 45:2, "I will go before thee, and make the crooked places straight: I will break in pieces the gates of brass, and cut in sunder the bars of iron." This is a wonderful promise from the Lord that He will go before us to straighten out the path. That means that He knows what lies before us and will help us with our journey. The rest of this verse indicates that this not only involves preparing the pathway before us but also breaking through the obstacles that would hinder our progress. So, when it seems like the Lord has asked us to do a difficult or even impossible task, just remember this verse. If He has asked you to do something, He'll prepare the way for you and help you get through those hindrances to accomplishing the task. This doesn't mean there will be no problems along the way, but it does mean He's there, He knows the best way through/around/over the obstacles and He will help you navigate the journey. For my card design this week, I used an old Mojo Monday sketch (MOJO406). I kept to a masculine theme this week with the colors and designs on my patterned papers. The background cardstock was embossed with an embossing folder and then, using a direct to paper technique, inked with distress ink to bring out the embossed pattern. The edges of all the other papers were inked as well. I went back to a technique I used a lot in my scrapbooking days: covering chipboard with patterned paper. After adhering the stars to the back of the patterned paper, I used my new fingertip craft knife to cut them out. It works so much better for me than a traditional straight craft knife. The edges of the stars were inked with distress ink. After adhering the stars to the card front, they were given a coat of Glossy Accents. I hope you'll visit the Word Art Wednesday blog for lots of inspiration using this week's FREE digi WORDart. We'd love to have you play along with us. Remember you have 2 weeks to link up your projects. Such an encouraging and comforting scripture, Stephanie. 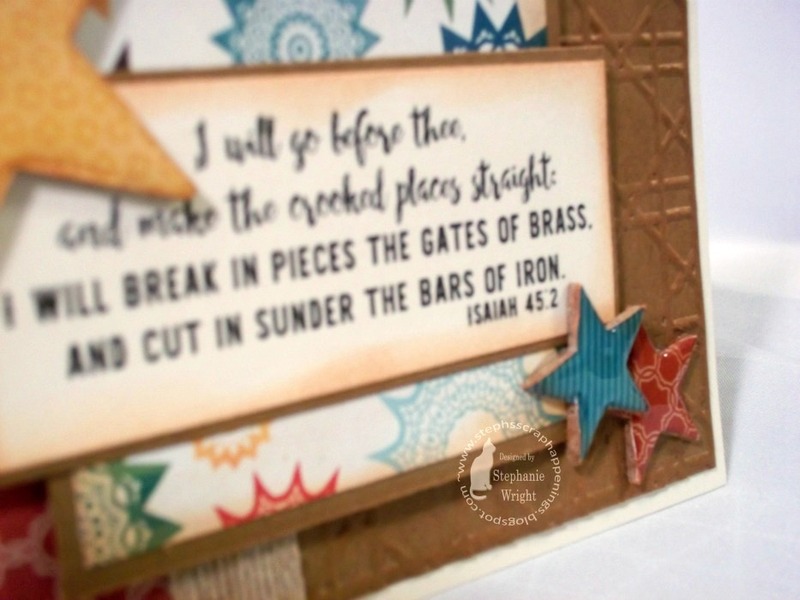 Great card design and papers to showcase the scripture as well. Thanks for sharing with Eureka Stamps this week! Great card and the stars are so wonderful, great job. 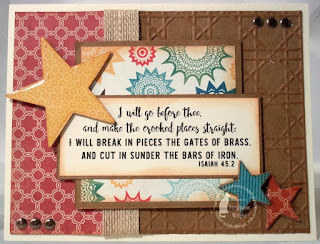 perfect for our challenge at Eureka stamp: Pile it on!. Thank you for joining us and good luck. Fantastic masculine card Stephanie, love the colours and the layout! Thanks for playing along with the SHOPPING OUR STASH crew for our "3-2-1" challenge! Brilliant card, Stephanie, love the elements, inking and colouring. Sorry you've been unwell pray recovery is completely there now. Sorry too, to have been bit late coming around. So great to be part of the DT this month, a real privilege for which I am so very thankful to the Lord. What a great card! I love your color choices and fun layout. Thanks for joining us at Aud Sentiments for our “Anything Goes” Challenge; I hope to see your work in our future challenges too!